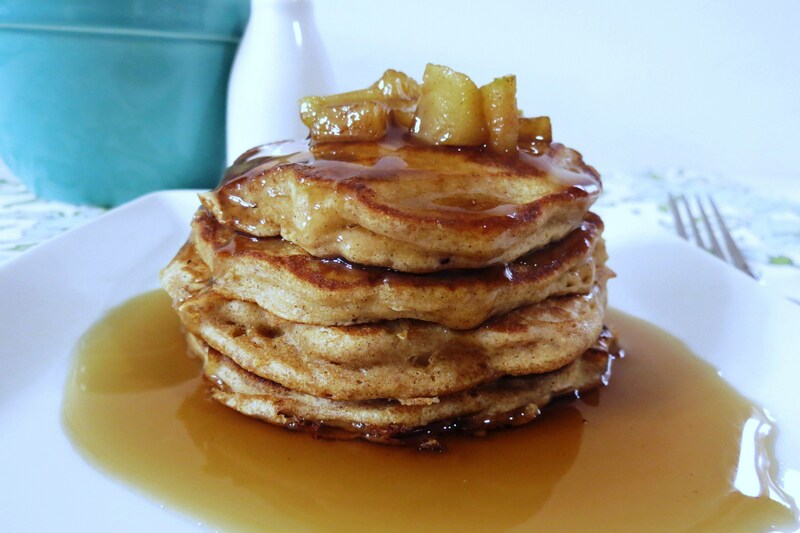 I am continuing celebrating Pancake week with my Cinnamon Apple Pancakes. 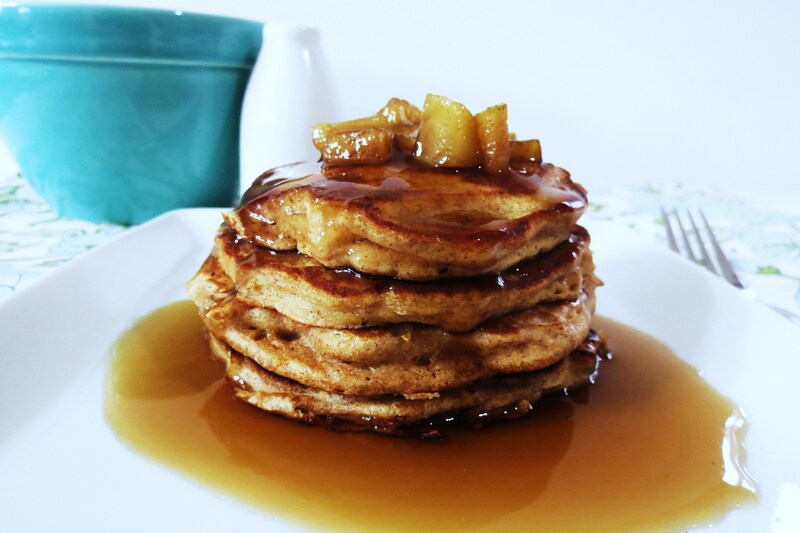 I don’t know if there is any better way to start off a morning then with a stack of yummy pancakes. As you can see from yesterdays post I kind got a thing for pancakes. Whats even better, is their guilt free. I love that!! I meant to share with you yesterday that iHop is celebrating National Pancake Day on February 28th by giving away a small stack of buttermilk pancakes. In return, guests are asked to consider leaving a donation for Children’s Miracle Network Hospitals© and other designated local charities. It’s for a good cause. No I won’t be going, personally I am not an iHop fan, but I thought I would share that with you for those who are. You can get more information here. 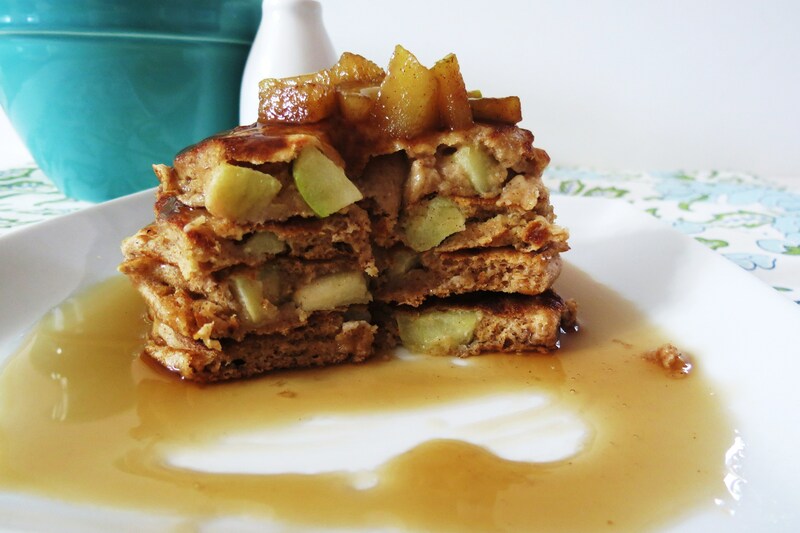 Now for today’s Pancakes, I made Apple Cinnamon Pancakes. There are so good, a Hubby favorite. They are chock loaded and I mean loaded with fresh apples. When you look at the picture above you wouldn’t know, but then you cut into them and this is what you see. 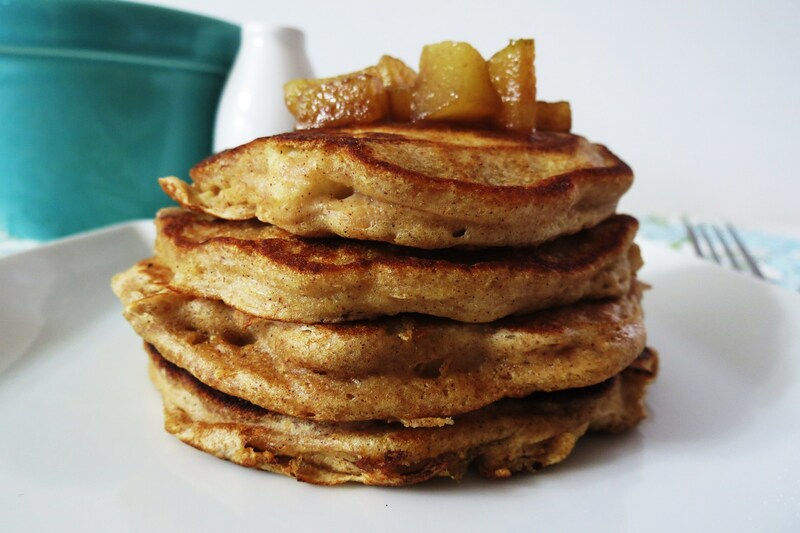 I made these the same as my regular pancakes, but I realized from yesterdays pancakes that I thought it was the wheat flour in comparisons to the whole wheat pastry flour, is what made my batter thicker, it wasn’t, it was the Chobani yogurt. Today I used Trader Joe’s plain Greek Yogurt and I had more of a pancake batter, it wasn’t so thick. I noticed that Trader Joe’s Greek yogurt isn’t quite as thick as Chobani yogurt, so that’s why the constancy is a little different. The best advise I can give, is if your batter seems to thick, add a little bit of milk to it. That will thin it out and your pancakes will be perfect!! With the left over apples, I decided to put them in a bowl, add a pinch of cinnamon and a teaspoon of brown sugar and a splash of water, cover and microwave for 1 minute. I used that as a little extra bonus topping. It was good, tastes like apple pie. I do that for dessert to, top with a little bit of frozen yogurt, yum! I really love apples. That reminds me I need to get more. I am so loving pancake week. Did you know you can freeze pancakes? I froze some of the Blueberry Lemon Pancakes, that way I can take them to work next week and have a good hearty breakfast. Funny, I don’t think there is anything I don’t freeze? I have been begging my Husband for a freezer, but it’s been no, hopefully someday. Notes: The thickness of your greek yogurt may make the batter thick, just add a pinch of milk at a time to make more of a pancake batter. Spray a nonstick skillet with cooking spray and place 1/4-cup batter onto skillet and cook till bubbles start appearing through the top of the pancake and then flip. NOTE: Cook on medium heat and I flattened out my batter with the spatula to cook more evenly. I spray cooking spray between each batch of pancakes. 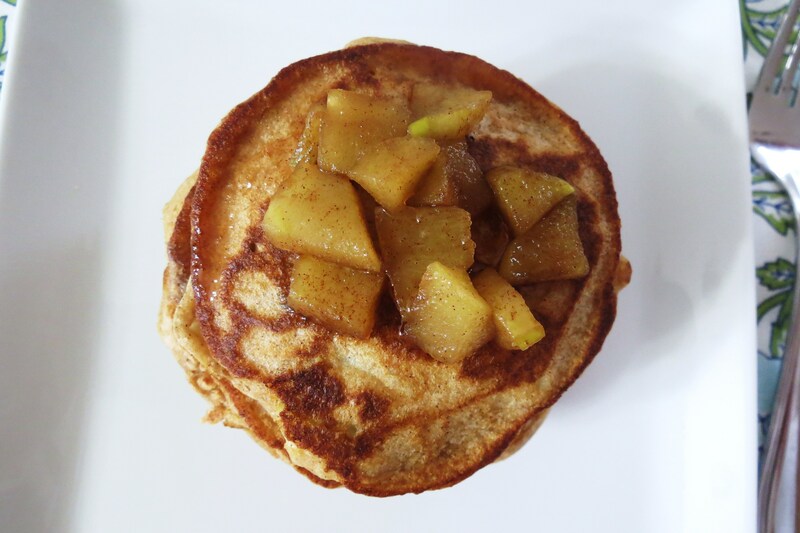 Note: Optional topping: If you have leftover apples, place them in a microwave safe bowl, add a dash of cinnamon and 1 tsp of brown sugar and a splash of water. Cover and microwave for 1 minute, place on top of pancakes. Is that all, give me more baby!! 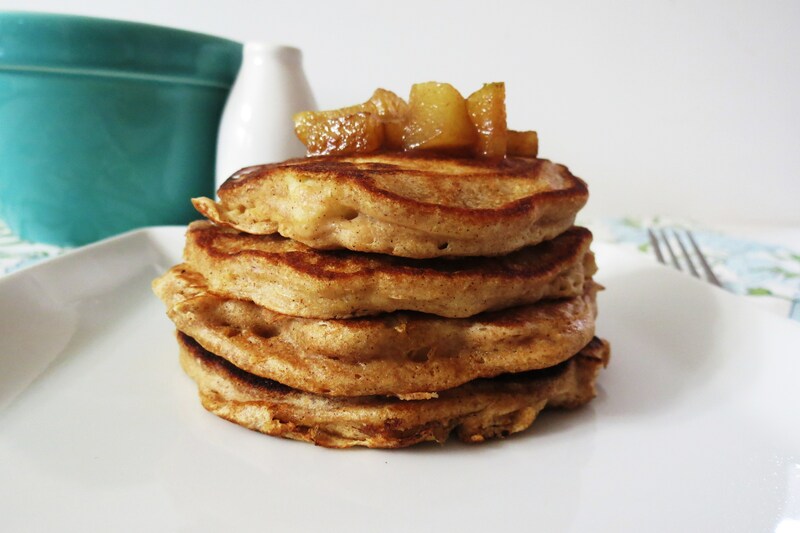 I hope you have liked my latest addition of celebrating Pancake week! Now I can’t make more pancakes this week, however I have a sneaky trick up my sleeve, ha ha, but shhhhh, family can’t know. I know a secret way of getting them to eat pancakes at night, but I’ll share more of that with you later this week, just hope my creation in my head works. If not I’ll show ya the flop!! Hey, I’m only human and I’m still learning! Have a great week, and now get out there and make pancakes!!! 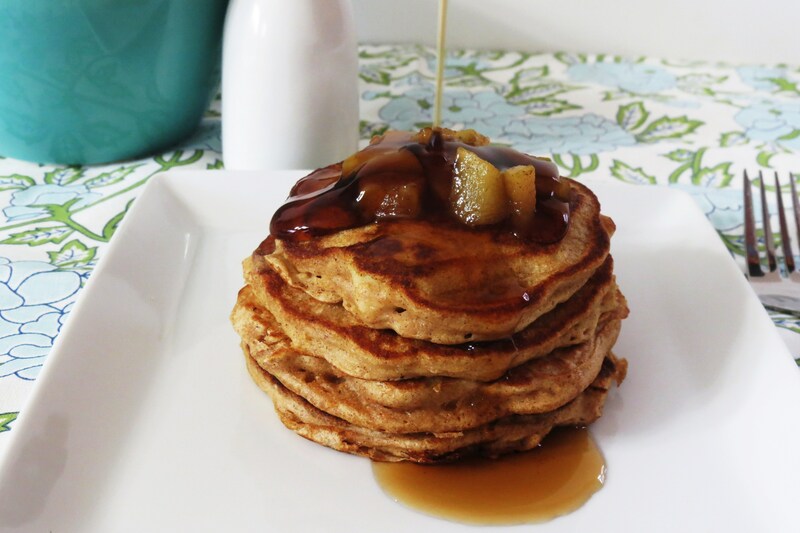 I’m so sad that I already ate breakfast…and it was definitely not these pancakes. I actually LOVE thick pancakes so I’m gonna buy some Chobani for these. Next weekend – perfect birthday breakfast! 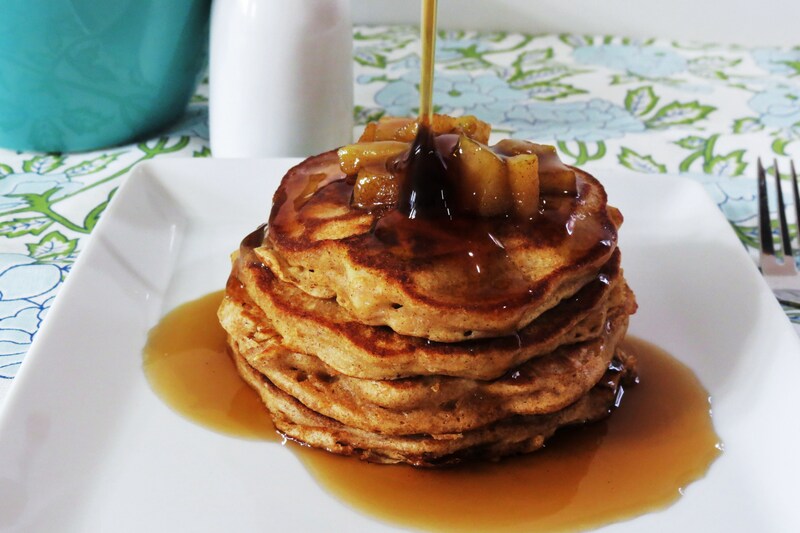 Jennifer, these pancakes look insanely mouthwatering! I bet they tasted just as good as they look, too. Great recipe! Thanks for sharing. Hi jen, beautiful pics! 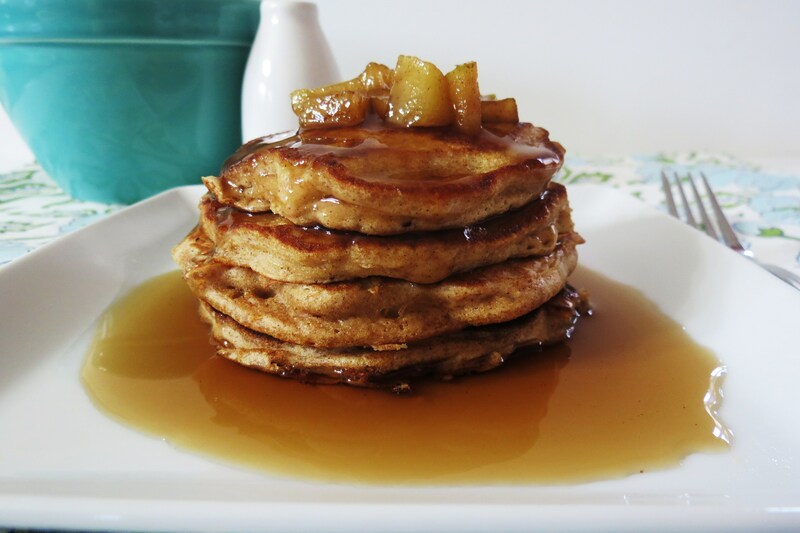 I love apple and cinnamon in my pancakes too…one of our favorite add in’s! Wanted to let you know I fixed (re-wrote!) my peanut butter dip recipe! Yum!! Love all the flavors together in a pancake! 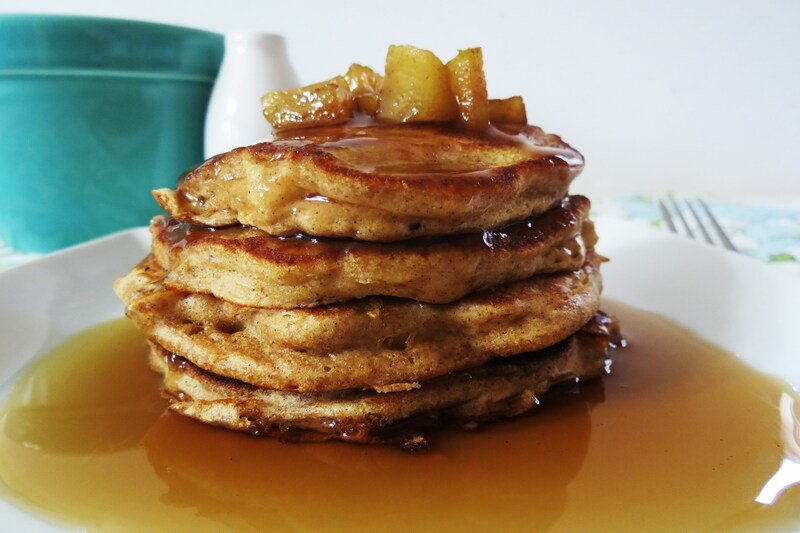 I need to get on Pancake week – I had no idea! Now this is my type of breakfast! Ooh I’m going to make some of those tomorrow, thanks for posting! Holy cow they look wonderful! Apples and cinnamon is my all time favorite combination. These pancakes look delicious! These look amazing! 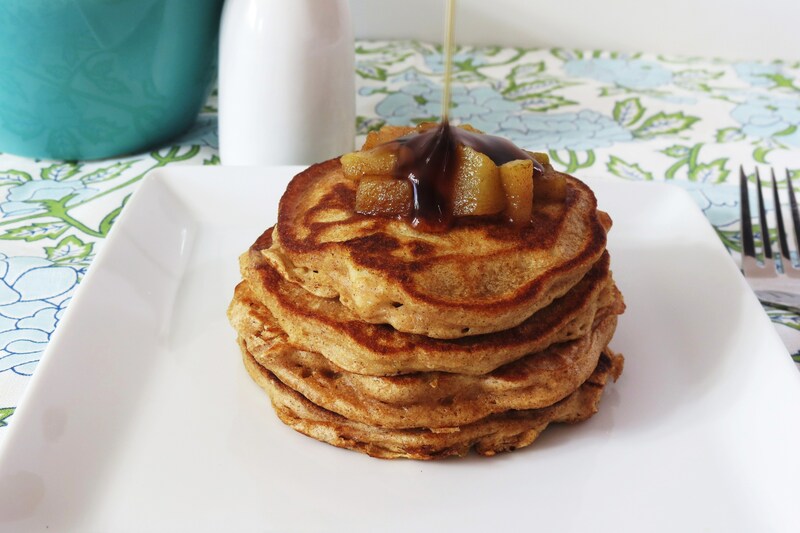 For me, they’d have to be apple pancakes, since I’m allergic to cinnamon…but I wish i wasn’t! You are so lucky to have a Trader Joe’s in walking distance. But then again, I’m lucky I don’t, that is a dangerous store for me!! I have this thing for cinnamon, so you struck me nerve. Also, it reminds me that we really can have breakfast any time of day we want,right? These pancakes look incredible!!! Thanks for sharing on Fit and Fabulous Fridays! Thanks for having me. Can’t wait to see what I’ll post next. Do you think I can substitute the greek yogurt used in the recipe for plain normal yogurt?